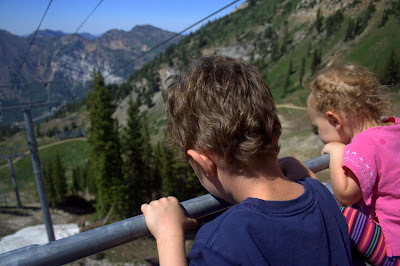 Ski lifts are generally not on my radar in the middle of August, but after taking the tram at Snowbird all the way to the top, we&apos;ve added it to our list of summer favorites. 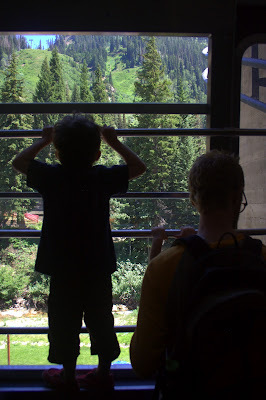 The tram ride itself was a major highlight for our kids, who climbed up on the railing to stand and look out the window (it&apos;s totally glassed in, don&apos;t worry) as we glided toward the top. It was amazing to witness the change in scenery as we rose higher and higher. We left the green grass and flowers behind, then the pine trees, finally we were at the rocky, barren top with sweeping views in all directions. The air felt so clean and bright, and we were surprised to see piles of snow! The kids thought it quite novel to be able to throw snowballs in the heat of summer. It was definitely cooler at the top. We were fine in shorts and t-shirts, but you might want to bring a sweatshirt, just in case. We opted to walk down the trail a bit and pick up the smaller lift to ride all the way down. Although riding a regular open-air ski lift with a four-year old and two-year old isn&apos;t exactly relaxing, I wouldn&apos;t have traded it. They were thrilled to look down and see the grass and streams so far below their feet and to feel the wind whistling in their ears. 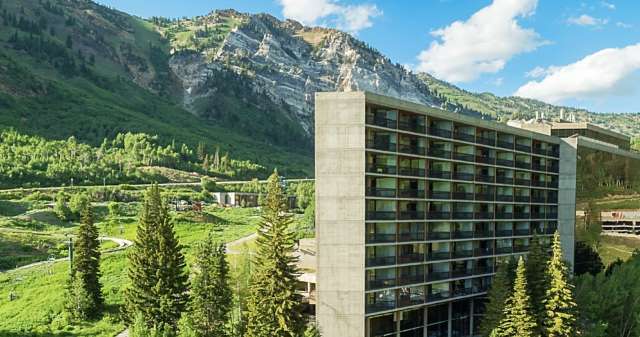 Before heading up there, we didn&apos;t realize that Snowbird is quite a busy place in the summer. People were playing on the awesome bungee trampolines, racing down the alpine slide and the incredibly fast zip line, hiking, climbing the rock wall, and they even had bouncy houses for the kids. The restaurant was full and they were setting up for a concert on the patio. They also have horseback riding and great mountain biking trails. You can buy an all-day pass to try it all. Next time we go, we&apos;ve promised our four year old a turn on the bungee trampoline! The Snowbird Tram is a featured attraction on the Visit Salt Lake Connect Pass.